Our martial arts centre is a spacious, fully equipped facility with a proper martial arts safety floor. We offer classes catering for all ages and abilities from beginner to expert, young and old alike. Located just 10 minutes from Preston town centre it is easily accessible from Preston and the many surrounding towns and villages. in a fun and safe environment then we can provide you with this and much more! We offer all new students a free 30 day trial to find out if martial arts is right for you and your family. 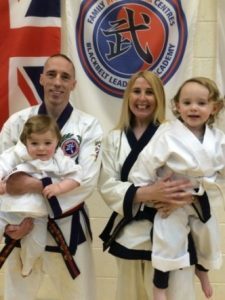 We are extremely family friendly and all classes are taught by professional male and female Blackbelt Instructors with over 30 years experience in the martial arts. With multiple beginners, intermediate and advanced classes per week for adults, children and families we are sure to accommodate you and your family. Please leave your details opposite for a brochure, timetable and VIP Voucher entitling you to a FREE 30 DAY TRIAL! Alternatively you can call 01772 422777 for more details and to book your first free lesson. for Martial Arts, Karate and Self-Defence in the Preston area.